RLE was saddened to hear the news of Amar Bose's passing. Dr. Bose was a pillar of the RLE community, and inspired our members through teaching and research throughout his time at the Laboratory. His brilliance, creativity, immense generosity, and contribution to our research community will continue to guide us. Our thoughts are with his family at this difficult time. "At every crossway on the road that leads to the future, each progressive spirit is opposed by a thousand men appointed to guard the past." Amar G. Bose (SB/SM '52, ScD '56) is founder, technical director, and chairman of Bose® Corporation of Framingham, Massachusetts. Dr. Bose joined RLE in 1953 and worked with Professors Yuk Wing Lee and Norbert Wiener on statistical communication theory. In 1956, Dr. Bose began research in physical acoustics and psychoacoustics. His research and patents in acoustics, electronics, nonlinear systems and communication theory led to the formation of Bose Corporation in 1964. Today Bose designs and manufactures high-quality audio products for consumer and professional use, and conducts research in several fields. As a result of developing a strong research team, Bose is the leader in creating sound systems that approach the realism of live performances. In addition to his work at Bose Corporation, Dr. Bose has served on the MIT faculty since 1957. I joined RLE as a research assistant with Professor Ernst Guillemin in 1953. However, in the fall, Professor Wiesner insisted that I work on some ideas Norbert Wiener had which Wiesner felt were applicable to electrical engineering. Even with a minor in math, I didn't have the slightest idea about Wiener's mathematics. Professor Yuk Wing Lee, the project's supervisor, gave me Professor Wiener's notes and instructed me to read them. I couldn't make head or tail of them. In February, Lee said there was going to be a mathematics conference at MIT in June. I was to speak on Wiener's theory! Two weeks before the conference, everything suddenly became clear. I was scared because it was my first talk, and everyone at the conference was a renowned mathematician. It went well until Wiener raised his hand. I answered his question incorrectly, and calmly he repeated the question. Fortunately this time, I was able to answer correctly. Following the conference, we developed a close relationship and met in my office at RLE almost daily for the next ten years. After my thesis exam, Jerry Wiesner asked about my plans and if I was interested in teaching. I told him that I was recruiting for a research position in industry which I intended to pursue after spending a year in India on a Fulbright fellowship. I explained that I had no interest in teaching. Jerry offered to bypass the teaching assistant and instructor positions. He asked if I would be interested in joining the faculty directly. I thanked him, but declined. After his kind offer, I decided it might be appropriate to ask for something I really wanted. I had recently purchased a hi-fi loudspeaker based upon what I thought were meaningful specifications. My engineering knowledge told me the specifications were good, but my musical training told me the performance was not. I asked Jerry if I could stay at MIT over the summer without pay and use RLE's equipment and anechoic chamber to resolve my dilemma before leaving for India in September. He agreed. That summer, I arranged with Radio Shack to borrow all the brands of speakers they carried at that time. I wanted to measure them for my own knowledge, and I offered them a copy of the measurements in return. I didn't know it at the time, but those measurements became the basis for their Realistic speaker line. Two weeks before leaving for India, I was swimming in the MIT pool when a colleague informed me that the fall catalogue listed me on the faculty with a one-year leave of absence. Before leaving the building, I decided that I probably wouldn't lose all my research ability if I taught for just two years upon my return from India. During the next year, I taught statistical communication theory at the National Physical Laboratory in Delhi, India. In the evenings, I read acoustics books since my experiment from the previous summer didn't resolve my problem, and I had never taken an acoustics course. 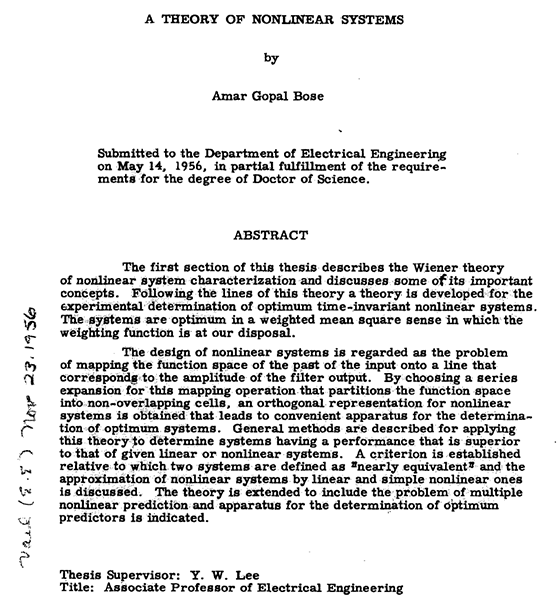 When I returned to MIT in 1957, my first teaching assignment was in electromagnetic field theory. In 1959, we started an experiment in RLE to determine if the many cone resonances of closely coupled loudspeakers produced audible sound coloration. We compared an array of twenty-two closely coupled loudspeakers on an eighth of a sphere mounted in the corner of a room to a similarly mounted ideal pulsating eighth of a sphere. Although the latter can’t be constructed, its impulse response through the room to a microphone can be determined. It is the integral of the response to an electrical spark discharge at the apex of a room's corner. The experiment took four years to complete because there were many obstacles. Tom Stockham convolved the impulse response with musical signals into the TX-2 computer at Lincoln Lab, where he made the first digital recordings of high-fidelity sound. Over four years, he reduced the computation time from twenty hours per second of music to seven minutes per second. This was the basis of his contributions to digital signal processing and fast Fourier transforms. By 1963, I had several patents in electronics and power processing, amplification through switching techniques, and acoustics. MIT gave me the patents, and I tried unsuccessfully to license them. One day, Yuk Wing Lee called me into his office and wanted to tell me of his experiences during World War II. I didn't know why he wanted to do this, but he always made his point by describing a situation and then allowing the student to draw his or her own conclusion. He said that he had returned to China in 1929 after receiving his doctorate at MIT. He was teaching in Peking, and in 1939 he sensed the impending war and decided to return to the United States. He arrived in Shanghai three days before the scheduled ship, but the Japanese arrived the next day. In order to survive, he became a curio dealer. He then explained the dream of curio dealers: One day, an object of value would come into their hands, that they would recognize it, and not let it pass through their fingers. At that point, he thanked me for coming to his office. After I left, I realized he was telling me that my patents were such objects of value; that I shouldn't let them slip away through licensing, but that I should form a company. In the spring of 1964, I started meeting once a month with Professor Lee, my college roommate Chuck Hieken (SB/SM'51), and Sherwin Greenblatt (SB '62, SM '64), a master's student in electronics. None of us knew anything about business, and we were not particularly interested in the aspects of a corporation. However, our meetings resulted in the formation of Bose Corporation in August 1964. When Dr. Wiesner and RLE's business manager Ralph Sayers learned we were hunting for a building, they offered us the use of RLE's facilities for the company's work on an honor system until we found a proper location. Bose Corporation actually existed in RLE through November 1964. In 1965, we realized that in order to produce a superior loudspeaker we needed a better understanding of the recording process. To this end, we spent two years recording the Boston Symphony and Boston Pops orchestras. In 1967, we produced a speaker that was an eighth of a sphere with a power amplifier and equalization located inside. It was very advanced for its time, but it required two unobstructed corners in a room. Despite a marketing survey that said we would sell a million dollars of these speakers in the first year, we made sixty units and sold only forty. We realized that we needed to design something more practical that still used the technology we had developed to produce better sound. We did just that, and the result was the model 901© loudspeaker. When we formed Bose, there were about 450 companies in our field, but they did virtually no research. Our interest was the research, and we believed that would be a reason for us to succeed. We didn't know anything about business or production, but research was to be our distinguishing factor. Our largest area of growth has been in consumer products such as complete hi-fi systems. Our original equipment manufacturing business for automobiles and our professional sound business are also growing. We found that it's possible to produce better sound in an automobile than in the average home. In the home, there are three factors that we can't control which have a significant impact on the perceived quality of sound. They are the acoustics of a room, the location of loudspeakers, and where a listener sits. In automobiles, these factors are known, and we can design for them. We're also doing fundamental research on automobile suspensions. A car that is smooth over bumps can generally roll and pitch. If it has good roadability, you need a chiropractor in the back seat. Searching for a theoretical limit on performance, I spent five years on purely mathematical analysis. In 1985, we began work on the hardware. We now have the first car. It's not completely outfitted with its algorithms yet, but it's quite promising. Our new instrument called Auditioner© can let one experience the actual sound in a building or public space during its architectural design stage. The architect gives us the blueprints and tells us what materials will be used. If it's an auditorium, you can select a specific seat and hear the sound that will exist when the building is constructed. When the building is completed, we put the Auditioner in the seat you originally specified. You can then compare the sound it produced to the actual sound. It will switch between the two, and it's so accurate that you probably won't be able to hear the difference. With the Auditioner, if we don't like the sound, the designer can change it with a pencil and paper instead of concrete and steel. There's no longer an excuse for designing poor acoustics or installing poor sound systems. The key is having the nucleus of a company that's competent in its profession and has high integrity. Without character and integrity, you can make a lot of money, but I don’t think you can be proud of it. People will tell you that I impose extremely high standards, not only for them, but for myself as well. No matter how well we’re doing today, we must do better tomorrow. Most of Bose's educational activities are with MIT. We give awards to senior MIT professors and support research and students. But our support isn't just financial. There's also interaction between our engineers and MIT students. I've observed the excitement resulting from this on both sides. In fact, Al Oppenheim's group at RLE gets together regularly with Bose engineers to discuss research. MIT will have to persuade industry that their future depends on research. Industry can supply the funds to do challenging projects, but they will require that certain information remain proprietary, and they want the patents that arise from the work. Universities will have to compromise when industry sponsors research. When they get funding on that basis, universities will be able to do great things and students will be highly motivated. Every September when I start teaching, I wonder how I'm going to get through everything on my agenda. By December, when I see my students' faces and their ability and enthusiasm, I say to myself, "C'mon, we're gonna do it for another year." I've been saying that for thirty-eight years.